A late fightback by captain Stuart Broad proved in vain as England suffered a last-ball defeat by a New Zealand XI in their final warm-up game. Jos Buttler hit a second successive half-century while Eoin Morgan also weighed in with 51 as the tourists reached 170-5 at the Cobham Oval. The hosts were coasting to victory before three wickets fell for four runs, including Tom Latham for 64. The final ball finish made it exciting for the big crowd, but it should not disguise a poor bowling performance from three of England's attack. 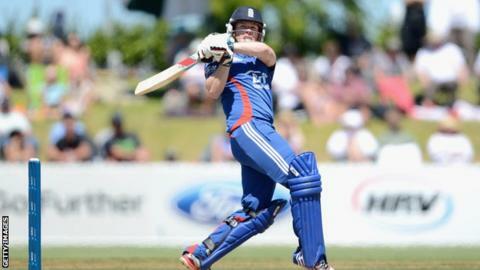 170 was a defendable total after Eoin Morgan and Jos Buttler repeated their powerful hitting of the previous day. James Tredwell and Steven Finn had rare off days. Jade Dernbach threatened to rescue the match with a skilful final over, but his bowling earlier was reminiscent of his efforts in India that cost him his ODI place. But Broad's 3-24 proved in vain, their opponents winning off the last ball. Having won their opening warm-up game by 46 runs 24 hours earlier, Broad and his players have plenty to ponder ahead of Saturday's opening Twenty20 international with New Zealand in Auckland. England opener Michael Lumb said Wednesday's defeat was an indication of how tough the three-match series would be. "I think it will be tight," said the Nottinghamshire batsman. "A lot of people have written them off, but you can't take them lightly. "It would be foolish to do that - they've just beaten South Africa in a one-day series over there. They're a proud nation, and they'll come really hard at us." Buttler followed up his unbeaten 57 in the opening game with 51 off 31 deliveries, which included five fours and two sixes. He put on 87 with Morgan, who also struck two sixes. But it was not enough as New Zealand's openers Anton Devcich and Hamish Rutherford passed 50 in just 35 balls. Rutherford's dismissal brought Latham to the crease and he wasted no time reaching 50 from 29 balls. Steven Finn and James Tredwell struggled to make an impact for England, both going for 44 runs from their four overs. But Lumb said the match provided the workout they needed and was particularly pleased with the return to form of captain Broad after injury. "It was good, especially for the four bowlers, to be put under some pressure," said Lumb. "And if it comes down to it in the main games, we'll have had some experience a couple of times here. "It's great to have Broady back. His body is moving well, and he's bowling nicely. "He's obviously had a few little niggles, but he's back fit and raring to go. We're really chuffed with that."